Looking for an interactive attraction? Engage customers with the brand new Jotter Tablet Display A--a great tablet stand holder for trade shows, office lobbies, or retail! 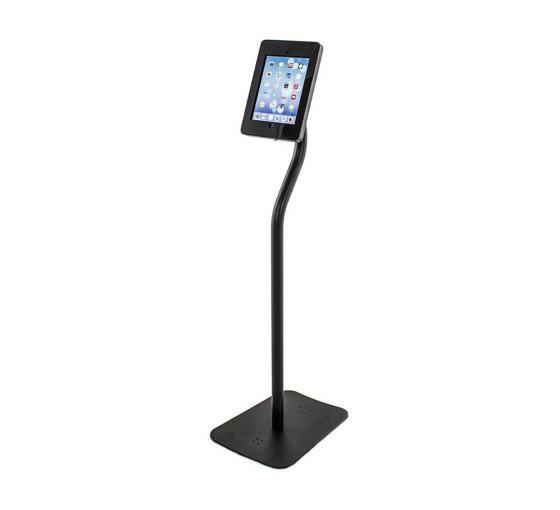 The Jotter tablet display stand has a pivotal head, allowing you to rotate the tablet 360˚ and adjust the angle 135˚ . Simply, insert the tablet and use the key to lock the case. The tablet is snug, secure and ready to use. The case allows for a working front and back camera as well. Use them anywhere you want to be hands-free. The Jotter Tabletop Tablet Display can be used to customize any display or countertop. To mount, simply drill into desired tabletop or display, and voila! These tablet stand holders are compatible with 2nd, 3rd and 4th generation iPad tablets. Available in 3 styles. Choose from Black or White.